Kwikonveyors Rivetless chains are widely used in the cane washing operation before milling, but can be applied to advantage in other parts of cane sugar mills. They are made from forged steel parts which are proportioned for high strength and comparatively light weight. Their simplicity of design permits assembly or dismantling by hand. Chains are furnished with heat-treated pins. 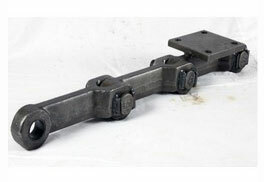 For added strength and durability, chains are frequently furnished with heat-treated sidebars, center links and pins. The pin-bearing surfaces of the sidebars and center links are finished for smoothness and close pitch control. 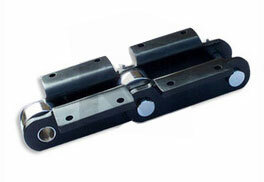 Pins are forged with double T-heads which lock in the sidebars and prevent pin rotation. When worn, the pins can be revolved 180°. This places the unworn pin surfaces in contact with the sidebars and center links, increasing the effective life of the chain. Designed for conveying heavy bagasse loads over long distances. Best solutions for boiler feedings, storage and further processing. Manufactured on precision presses with carbon steel for links, by operation blanking, piercing and shaving to avoid linear elongation. 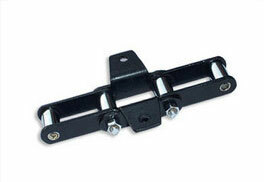 Side bars are also of straight link construction, made of carbon steel and designed for maximum strength. Case hardened steel pins are highly durable and provide greater resistance to wear. Pins are close fitting and can be rearranged for pressure lubrication. Case hardened bushings are wear resistant and tough, ensuring even bearing for roller and pin. Rollers are heat treated for better resistance. They are also well-bored and turn freely to ensure minimum wear. Designed to function under adverse conditions like abrasion and impact loading. Specifically designed for high wear resistance. Manufactured using carbon steel for links by operation blanking, piercing and shaving (to avoid linear elongation) on a highly precision presses. Shot Peening is done for links to improve fatigue resistance. Parts are precision machined to ensure perfect mating with pins. Pins are made from alloy steel, precision machined, through hardened and ground for perfect fitting. Designed to function under tough conditions of abrasion and impact loading. Manufactured on precision presses with carbon steel for links by operation blanking, piercing and shaving to avoid linear elongation. Side bars are of straight construction, made of carbon steel and designed for maximum strength. Pins are close fitting, corrosion resistant and can be rearranged for pressure lubrication. Ground case hardened steel pins provide greater resistance to wear and tear. Rollers are heat treated for better resistance and are designed to minimize wear and scrubbing. Ideally suited for conveyance purposes and effective in application. Installed at regular intervals and designed to allow chain to convey product. Chains manufactured using forged steel for links. Pins are made from alloy steel, precision machined, application. through hardened and ground for perfect fitting. Links are forged with steel and duly heat treated to improve resistance to wear. 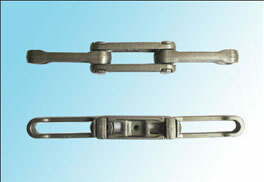 Each link has a "Big end" and "Small end" Profi,e to ensure maximum strength and rigidity of chain. Designed specially for carrying cane. Manufactured on precision presses with carbon steel & for links, by operation blanking, piercing and shaving to avoid linear elongation. 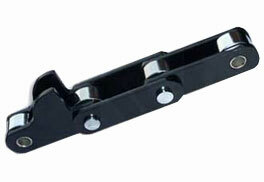 Side bars are also made of carbon steel and designed for maximum strength. 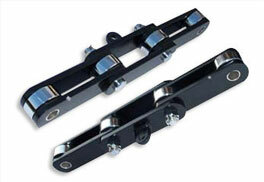 Pins and bushes are made of alloy steel and are corrosion resistant for extended chain life. Pins are precision machined, case carburized and then ground for perfect fit. Bushes are case-hardened/heat treated for greater resistance and toughness. Rollers are heat treated for better resistance. They are well-bored and roll freely to ensure minimum wear. All chains are big, rugged and are designed to withstand heavy loads. Very low wear and tear even on prolonged use.